Entries from Digital Intelligence tagged with "egypt"
Over $1.5 million was donated in Egypt through mobile technology during Ramadan according to data collected by TA Telecom. 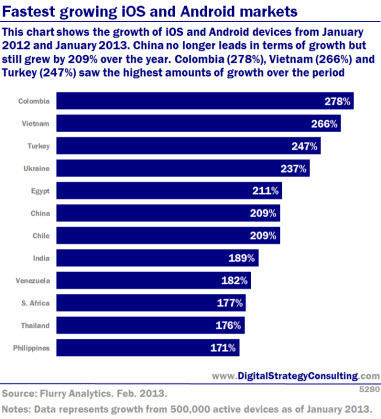 China has overtaken the US in terms of having the most active Android and iOS devices, according to new data. Mobile is increasingly the primary platform for internet access, with 18% no longer using fixed-line to access the Internet at all, according to a new global survey. The Global Consumer Survey (GCS) report from MEF, the global community for mobile content and commerce, found that security fears are the biggest barrier to take-up of mobile web access.